The notion of sustainable water use, even before an attempt to measure it as a process or define it as a goal, involves the normative determination of the cultural value of water sustainability. Human institutions are shaped by our core values, whatever they may be, and that is why a sustainability ethic must permeate global belief systems. As the social value of water sustainability is elevated to a social norm, water institutions will begin to change. The strength of this core belief will determine the extent to which policy can effectively utilize market processes in the pursuit of sustainability. There exists, however, an ethical disconnect between the institutionalized governance of a natural resource, which arguably constitutes the planet’s most valuable biogeochemical cycle, and the supply and demand fundamentals of water as a necessarily economic commodity. It is becoming increasingly clear that water scarcity results as much from an inefficient institutional structure as from the physical limitations imposed by the dynamics of availability. Institutional frameworks embody the formal and informal rules that govern human activity. As a subset, water institutions govern virtually all aspects of water — preservation, development, allocation, regulation, management, and sustainability. The challenge is that most water institutions were shaped by the ideological premise (core value) that water should be (is) an exclusively social good. Having developed in a period of relative abundance, the treatment of water as a public good did not expose the allocational shortcomings. Now, for all reasons, we are experiencing increasing volatility (and extremes) in the spatial and temporal scarcity of water. — Globalization fed by the high–throughput economies of industrializing countries. — Historic shifts in global population ecology. — Degradation of easily accessible water supplies and emerging contaminants. — Substitution of capital for ecosystem services in ‘managing’ the growing imbalances in water supply and demand. — Climate variability compounded by a loss of ecosystem services. While one could easily take a Malthusian stance and imply planetary limits to economic growth, such a position simply demonstrates the asymmetry of anthropocentrism. The principles of ecosystem sustainability arise more from the laws of thermodynamics and the conservation of matter than from the dominance of a particular species. Nonetheless, the human reality is that ecosystem services contribute to GDP in significant ways: (a) the production of natural resources, (b) the dilution and detoxification of wastes, (c) climate stability, and (d) biodiversity. Simply put, water (with its growing consumptive uses and its essential ecological functions) is emerging as a critical constraining/enabling component of global economic growth. Unfortunately, under governing frameworks that centrally allocate resources and institutionally set prices artificially low, ecosystem services are exploited as a means of ‘managing’ the imbalances rather than properly valued for their essential role in the search for sustainability. This framework yields the opposite of sustainability. Human capital is inconsequentially substituted for nature’s capital; that is, resources are inefficiently allocated. Water resource sustainability ultimately dictates the utilization of market processes that are invoked, to some degree, by all economic systems. In the economic sphere, the seemingly debilitating challenge is that ‘water’ has characteristics of a common natural resource, a public good, and a commodity. It can be considered ubiquitous globally but scarce locally; it is renewable but can be depletable; it has no substitutes but can be recycled; it is an economic input as well as a prerequisite for life; and while access to healthy drinking water is regarded as a human right, water can also be privately owned and transferred as a legal property right. Not only is this mix confounding from an ecological perspective, but it also forces the application of disparate and unwieldy economic principles that are called upon to determine the proper role of market mechanisms in advancing sustainable solutions. Given the preoccupation of neo–classical economics with utility maximization, optimality, and externalities, it is not surprising that the role of market mechanisms within the larger process of water resource sustainability is not well modeled. Socioeconomic questions surrounding water must be addressed (and gains from sustainability quantified by ecological economists) in order for water institutions to adapt to changing social values and embrace the institutional economics of water. This is the logic behind the opening assertion that water sustainability must be a core value. What does water institutional change look like? An illustration is contained within the Sustainability Assessment & Management process recommended by the National Research Council in its ‘Green Book’ report. The study analyzed the incorporation of sustainability concepts across all EPA programs and details an operational framework for integrating sustainability as one of the key drivers within its regulatory responsibilities. The report, in essence, is a description of the institutionalization of sustainability, one that embraces an impetus for market processes. This is derived from the application of ‘sustainability tools’ such as ecosystem services valuation, environmental benefit–cost analysis, integrated assessment models, and sustainability impact assessments. Quantitative tools like these have important implications for the measurement of meaningful performance indicators and enabling market–based mechanisms in the optimization of the social and economic benefits of environmental protection. While regulatory bodies such as the EPA are at the forefront of institutional change in the sustainable governance of water, a significant point to be made is that the full spectrum of water institutions must reflect the changing socioeconomic status of water — from irrigation districts to municipal governing boards. Nowhere is it clearer that the value of sustainability has yet to be even remotely priced into water, than in the institutional methods employed to actually set water rates. Again, our institutions are shaped by our values. Water rate schedules are not only the price charged for access to water but a reflection of the broader goals and policies of the institutions involved in rate making. This reality generates the ever–present discussion of the low price of water, to the exclusion of actually examining the underlying beliefs. Water institutions at the local (grass roots) level must transition from the politics of equity and fairness embedded in the cost of service model to the broader inclusion of environmental justice. An ethic of water sustainability as a core value would greatly reduce the clash between social equity and the incentives required for intergenerational sustainability. But the focus should not be on a commodity price that is expected to serve as an equilibrating mechanism for water supply and demand. Despite attempts to metaphorically (‘blue gold’) and strategically (‘water is the next oil’) compare the economics of other resources to the prospects for water, there are surprisingly few similarities that would portend a meaningful ‘commodity’ price, let alone a spot market for facilitating transactions. A more instructive comparison occurs at a product level. Consider that crude oil distills down into dozens of products, each representing distinct economic goods that respond to signals from market processes. Many of the practical challenges associated with water resource sustainability could be clarified, if not resolved, by the application of market processes at a product level; i.e., by the unbundling of ‘water’ into ‘water goods’. The following diagram is a stylized visualization of a framework for analyzing the potential contribution of market processes in the context of water sustainability (a detailed analysis is presented in The Horinko Group’s webcast, Investing in Water: The Rationale Beyond the Talking Points). This analytical framework seeks solutions to the tradeoff mentioned between social equity and economic incentives that is invariably at the center of water policy. Where market processes advance sustainability criteria, sending the proper institutional signals begins with the long overdue move away from treating water as a stand–alone public good. The private good characteristics inherent in many of the consumptive uses of water must be recognized. This is accomplished by unbundling ‘water’ into product–level water goods such as: water rights, which, as legal property rights, are as close as you can get to a private good; residential tap water, which is artificially characterized by water institutions as a public good; industrial process water where the benefits are already internalized in the private sector; desalinated water, which is certainly priced through a market process but has less–expensive substitutes; and so on. 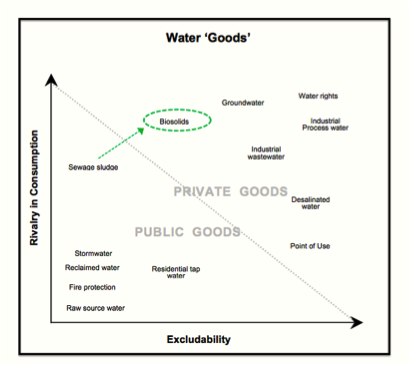 The diagram maps the position of water goods according to the qualitative mix of the two attributes used in economics to classify goods as common resources, public goods, near–public goods, or private goods. The attributes are excludability and rivalry in consumption. As can be seen, many water ‘products’ inherently exhibit the characteristics of economic or private goods. This framework can be used as a sustainability tool to identify water uses where the characteristics of private goods can be institutionally attributed in order to invoke the allocational efficiency of market processes. Sewage sludge is a good example. When the EPA enacted the Section 503 regulations defining the conditions for the beneficial use of sewage sludge, this product of the wastewater treatment process was transformed into biosolids, a private good around which a market developed. This institutional change is shown in the diagram by a shift in the positioning of sewage sludge to that of biosolids; representing a mix of more excludability (due to a market price for biosolids) and greater rivalry in consumption (biosolids are beneficially consumed). The idea is that many water uses can be made more sustainable through changes to the institutional rules that govern them. Reused water is another example of the benefit from institutionalizing market–based processes through the attribution of private good characteristics. If there are sustainability benefits embedded in reclaimed water (but a supplier can’t exclude somebody else for non–payment) then you can compensate for this market failure by institutionalizing the internalization of the external social benefit. The supplier of the good is getting paid. It’s clear that the offset is a form of direct subsidy, but at the product–level, the unintended consequences of cross–subsidization (bundling) are eliminated from policy considerations. Incentives (subsidies) or disincentives (taxes) can override the conditions of nonrivalry and nonexclusivity that deter private solutions. This is similar to the economic logic behind a system of tradable emission permits. The enabling nature of institutional change can be applied to the challenge of unfunded mandates in the looming stormwater regulations. Stormwater exhibits significant public good characteristics, much like raw source water. By creating a separate stormwater utility, however, the costs associated with the management of stormwater, if comprehensively identified, can be internalized with the customer as with water and wastewater utilities. By unbundling stormwater costs of service from the water and/or wastewater rate structures, the utility can create a separate cost of service model that reflects the economic realities associated with meeting the rapidly increasing stormwater regulations and addressing the problematic issue of combined sewer overflows. The water utility industry itself is a natural advocate for water institution change. Water utilities are recognizing the critical importance of market processes (not to be misinterpreted as deregulation) within the comprehensive regulatory structure. Markets could absorb some financial risk, thereby reducing institutional impediments to their own sustainability. Severn Trent, one of the ten privatized water utilities in the UK, issued a report that envisioned the gradual insertion of ‘market–like’ mechanisms into the water utility sector in order to meet the challenges of climate change and sustainability. The problem seen was that the policy and regulatory framework in the UK encourages a risk–averse approach to meeting standards that favors costly capital–intensive infrastructure solutions over more sustainable operating solutions, thereby placing too great a reliance on debt financing and jeopardizing the financial stability of the regulated water utility business. The force behind water institution change is the increasing social value placed on the notion of sustainable water use. As core values and cultural belief systems change to include an ethic of water sustainability they will influence the institutional landscape associated with water governance. And where governing institutions are looking at private sector participation as a funding mechanism, the institutional economics of water have an important role in sending the proper market signals necessary to facilitate a more efficient and sustainable allocation of water resources. Steve Hoffmann is Founder of WaterTech Capital LLC and Senior Advisor of Water Sector Sustainability and Investment to The Horinko Group. The Horinko Group’s Resource Solutions division seeks to promote an understanding of how market processes can be utilized to facilitate solutions to complex water resource sustainability issues. The nexus between water sustainability and market processes is the subject of the recent webcast, “Investing in Water: The Rationale Beyond the Talking Points” (The Horinko Group/Steve Hoffmann, May 2013).